I promised you in my previous post on Eggs in a French Toast Basket that another tasty breakfast was coming, and here it is! This recipe is as simple as sippin’ iced tea, and also happens to be one of my favorite morning treats. In only 15 minutes, you can be sitting down to a fresh-out-of-the-oven breakfast. Do I sound like a commercial? Good. I meant to. 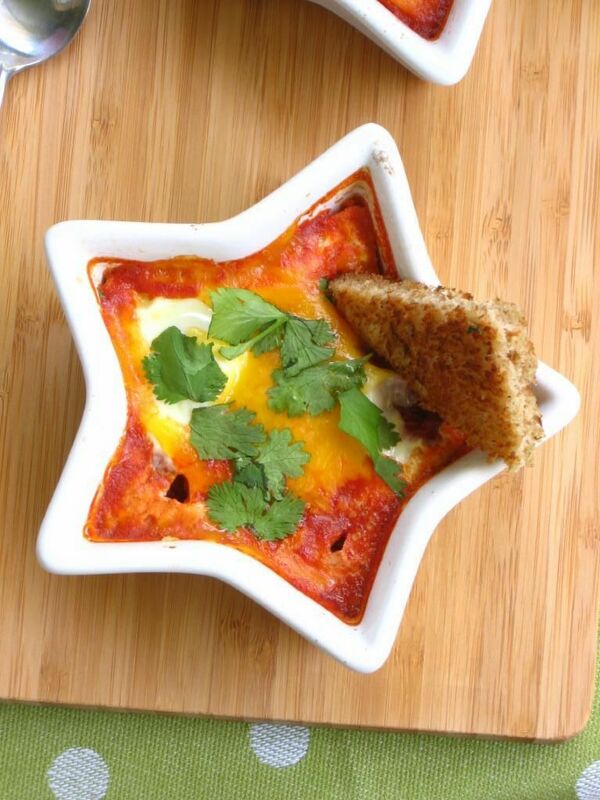 There are actually tons of variations on baked eggs. My version is simplified from the Williams-Sonoma recipe for Baked Eggs with Tomatoes and Cream to include the things I normally have on hand: salsa, cheese, and sometimes cream. Oh, and eggs. Cage-free eggs, that is, which I firmly believe are worth the dollar extra — even during my financially lean times. Happy chickens make me feel better while I’m scooping up warm yolk with my toast. Speaking of sopping things up with toast, toast points are so simple to make, and are a terrific accompaniment to this dish. Buttery, toasted triangles make the perfect little sponges for traces of salsa and egg left in your ramekin. However, if you’re on a lower-carb diet, omitting the toast makes this a completely low-carb treat! Now, you can make this dish fancier for a weekend breakfast. If you have the time and want to mix up some homemade salsa (like the delicious recipe below, compliments of my Aunt Jo Anne), indulge yourself. If you’d rather keep it simple and go the store-bought route, I’m infatuated with the Tex-Mexy On the Border salsa. Don’t hate until you try it; it’s fantastic — can’t believe it’s from a jar! Yields: A lot (how’s that for scientific?) — you can half it if you’re just using it for baked eggs here and there. Put tomato sauce into blender along with the rest of the ingredients, dropping in peppers as they blacken. Pulse until combined, but leave a little chunky if desired. Add salt as needed to taste. My mom uses quite a bit of cilantro, so go wild! Store covered in refrigerator. If you want to bake your own fresh bread for toast points, go for it. If you want to add fancy ingredients here and there (bacon or pancetta? artisan cheese? ), I fully support you. But just know that even on those busy weekday mornings, you can throw together some of your favorite jarred salsa, eggs, and cheese and have a few moments of blissful breakfast. Directions: Preheat oven to 350 degrees F. Generously butter two ramekins (or spray with nonstick cooking spray). Toast bread: Trim crusts if desired. Brush bread with butter on both sides and toast on a baking sheet in the oven for 1-2 minutes per side.Melt tablespoon of butter in a skillet over medium-high heat and toast bread, 1-2 minutes per side. Allow to cool slightly. NOTE: I actually usually toast my bread in the skillet, but I think the oven is a more reliable way to get a nice golden brown all over. And, you know, you’ve got it heated up for your eggs anyway! Spoon 3-4 tablespoons salsa into each buttered ramekin (enough to cover the bottom). 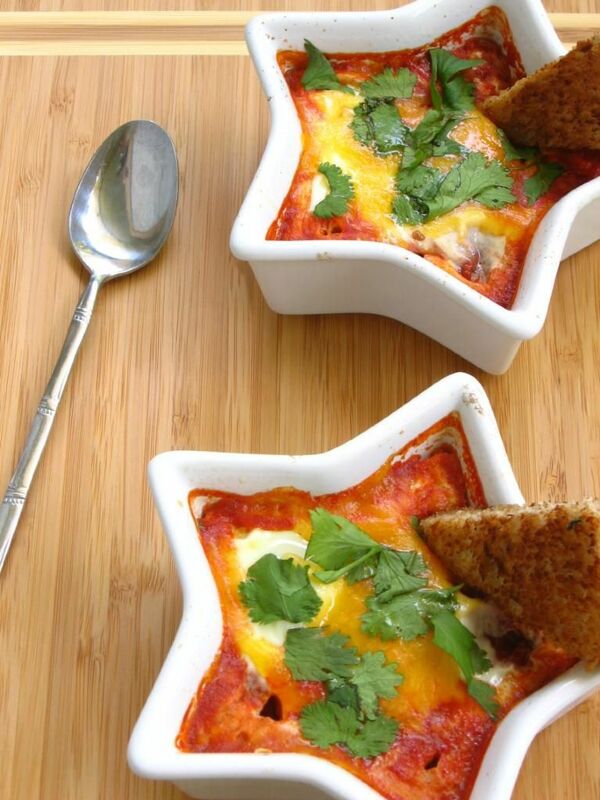 Break one egg over the salsa in each ramekin. Drizzle each egg with 1 teaspoon cream. Salt and pepper. Place ramekins on a baking sheet and bake until the egg whites are opaque and the yolks have firm edges and are soft in the center, about 15 minutes. 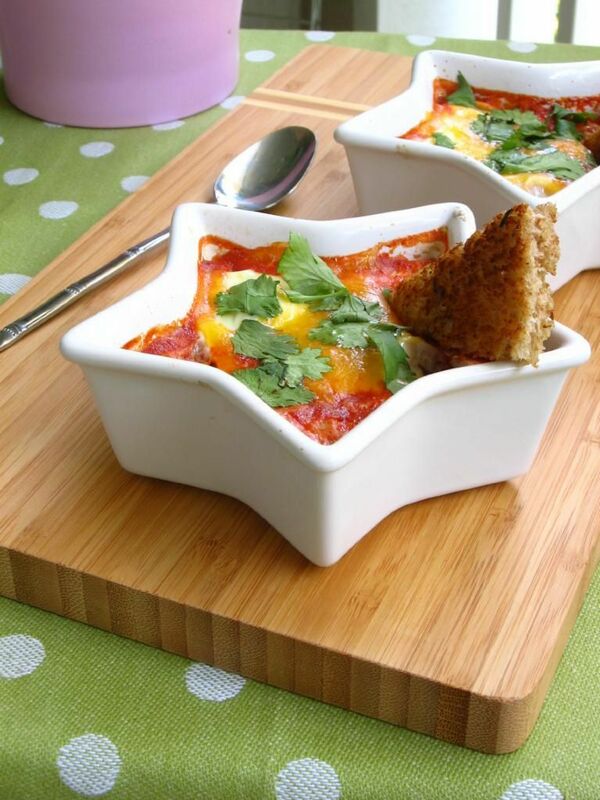 Sprinkle each ramekin with cheddar cheese and return to the oven just to melt, about 1 minute. Sprinkle with torn fresh cilantro. Serve with toast points, avocado, sour cream, etc. as desired. Nice looking presentation. I went to school with your mom back in Missouri. I love to cook too. Hi Debbie! Thank you for visiting!! It is always nice to meet my mom’s friends! 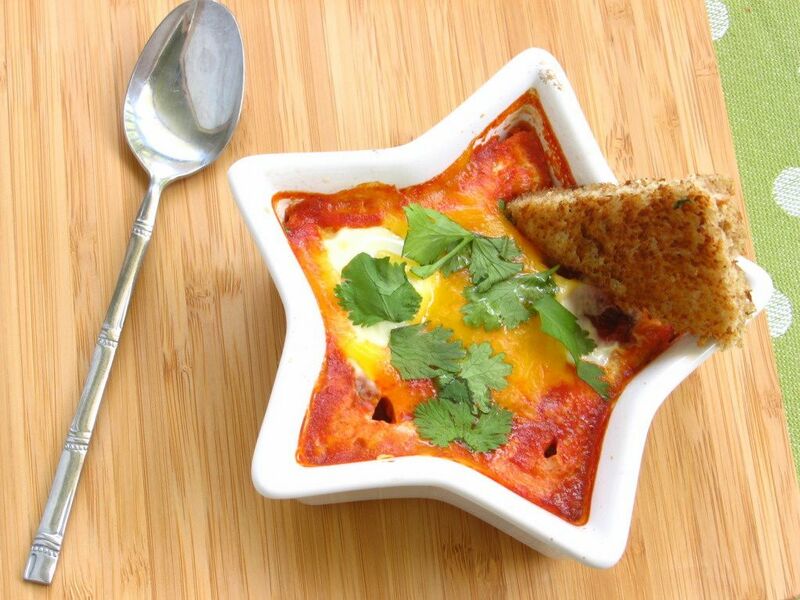 I love your star-shaped ramekins! They make me extremely happy! Thank you! I love them so much, too! My mom gave them to me as a gift. She says she thinks she picked them up at TJ Maxx years ago, so no telling where you could get your hands on some. I hope I come across them again sometime and can buy a couple more. Ooh you’re so right about On The Border Salsa- it is so good! My family makes salsa all the time but I still by OTB salsa because it tastes so fresh. These look yummy Julie. I want to dip toast into that runny yolk. Thanks Monica! I know, I’m crazy for that OTB salsa! It was such a nice find, too, because for years before I really cooked I was trying to subsist on that disgusting watery poor-excuse-for-salsa stuff you can get at the grocery store! Wonderful photos! And what a great dish to start the day with! These look so delicious! I’m definitely going to make these for breakfast tomorrow – thanks! Thanks, Eva! Hope you enjoy! Of course…looks more than appetizing. And right up my alley…eggs, salsa, cilantro, cheese – and of course I would add S.C./hot sauce and guac on top 🙂 Thanks for sharing, and you have the cutest sets of dishes! 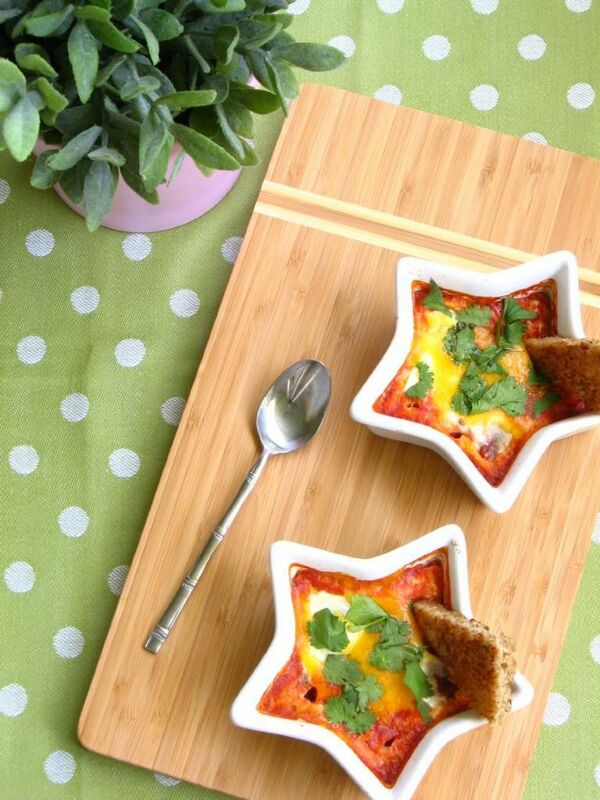 Gotta tell ya…those star ramekins are so dang cute!!! They stopped me in my tracks! That looks like an awesome dish for supper actually!! One of the teachers I work with lives on a farm, and I get farm-fresh beautiful brown and green eggs every week! Great way to use them up! 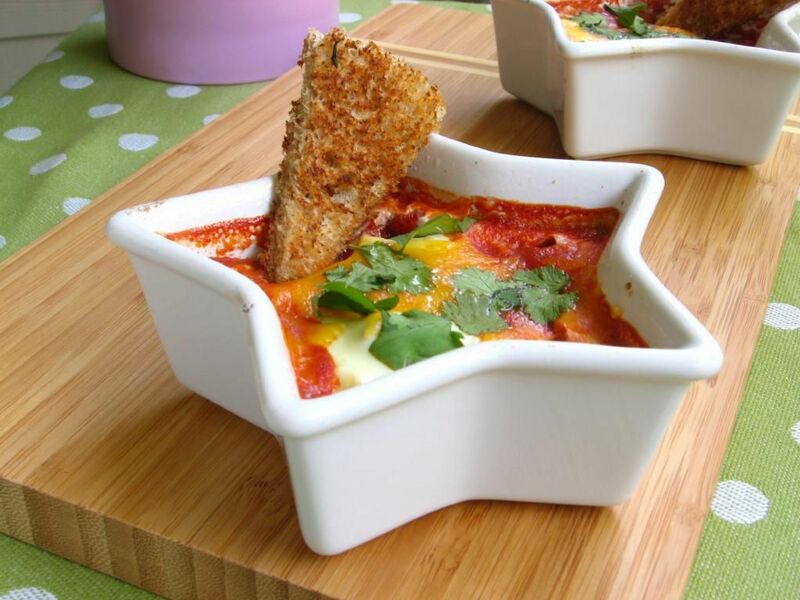 Anything you put in those cute little dishes would look yummy, but the contrasting colors of your baked eggs is gorgeous. I’m going to have to look for the salsa. I want this for dinner tomorrow! Beautiful presentation, thank you for sharing it! Hi Julie – I found your blog through I think Risa’s blog and love it – I’ve scrolled through several pages and have it bookmarked to come back to look at older posts. Love it! These look delicious! I may have to make them this weekend! I have some ramekins that I got for Christmas that I haven’t broken out yet and these might be just the thing to “break them in.” I love your green polka dot table cloth and I almost bought silverware just like that! Thanks for sharing this delicious looking meal! your photography is beautiful and that salsa looks delish. SO not crazy!! 🙂 Glad you enjoyed it! !